Wrigley was born on Sept 26, 2007. He is a golden retriever that already weighs 80 pounds. There is something very special about this dog. We knew that from the minute we brought him home. It was apparent to all of us in the family that he would be different and at that moment we thought that maybe he could bring some extra luck and hopes for the Chicago Cubs to win the World Series pendant this year. For non-fans, it’s been 100 years since the Cubs won the World Series. It’s long overdue. My husband was a bat boy in the 1970’s when they played their spring training games in Scottsdale and has been an avid fan ever since. I lived my junior high and high school years in a suburb outside Chicago and have always loved the Cubs, too. So, the name for our new dog seemed perfect. On opening day for the Cubs at Wrigley field, I turned on the television and I could not believe my eyes! Wrigley sat still for close to two hours (something of a miracle in itself) and actually watched the game. The Cubs won. And they continue to win. Neighbors have started to mention that maybe Wrigley is the reason for the team’s success. Our neighbor who has two fantastic Golden retrievers, lovingly call Wrigley the ‘Second Coming of Christ’. (He is so handsome!) At the local breakfast place that we take Wrigley to almost every Saturday, people are starting to talk about how he must be good luck for the baseball team. We say, we hope so and continue to follow the team winning game after game. I want to go online and find a Cubs dog bandanna. No luck so far. If anyone knows a place where I can purchase one of these, please let me know! When I find one, I’ll take his picture. More on this as the season progresses! Thanks, Andy. I have been looking for a week! I love that picture of Wriggles!! 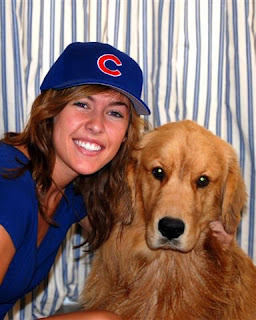 Laura will miss Wrigley when she's gone. What a great picture. It did not occur to me while we were talking at breakfast the other day that you are a Cubs fan. I grew up in Bolingbrook, IL and was/is an avid Cubs fan. My uncle somehow got free tickets during the years of Ryne Sandberg (who I thought I would marry ), Ivan de Jesus, and Dave Kingman. We used to sit on the 3rd base line around the 3rd row for a few years. I used to play softball, and my # was 23. I always loved Harry Caray singing "Take Me Out to the Ball Game" during the 7th inning stretch.